FO: Silk Shrug | Stitch, Brinn, Stitch! Welcome to Raglan month (well, April apparently was) and NaKniSweMoDo number six! Pattern: Featherweight, mostly for the cast on number and divisions. 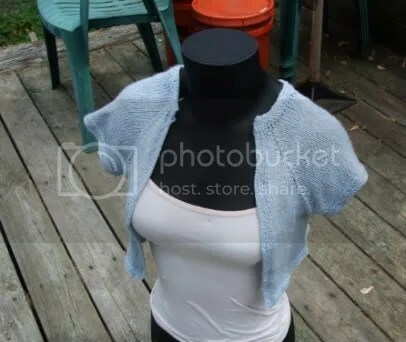 Mods: Clearly, shorter body and shorter sleeves and thicker yarn. Okay, it looks a little funny on Elizabeth because her wide shoulders and tiny tiny waist make her distinctly apple shaped, but my proportions are more balanced, so it looks a lot better on me. I like it a lot, I have worn it a couple times already. I usually wear it open, like the first picture, though I often pin the bottom closed with a bobby pin or something. It’s a great layer over tanks and tubes (I’m awkwardly uncomfortable in tube tops even though I have a ton of them). The only problem is that the back section is a little too wide, and if I use this pattern again, I’ll cast on fewer stitches for the back section. 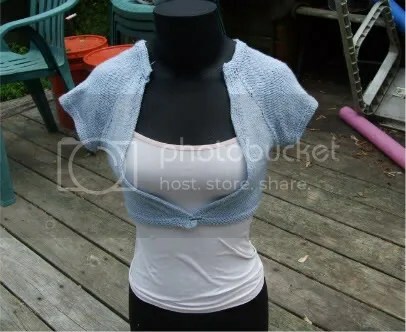 I certainly don’t intend to knit Featherweight in lace weight again (oh god), but I could maybe use another little shrug like this ones. It’s totally casual–throw on and go–and that’s great. Also: the yarn. It gets a bad rap on Ravelry for being pilly, and I wouldn’t make it into socks because of that, but as a shrug, this yarn is wonderful. It was such a joy to work with cause it’s SO SOFT. Plus, Regia is a pretty great company. So yes. Yarn love here.